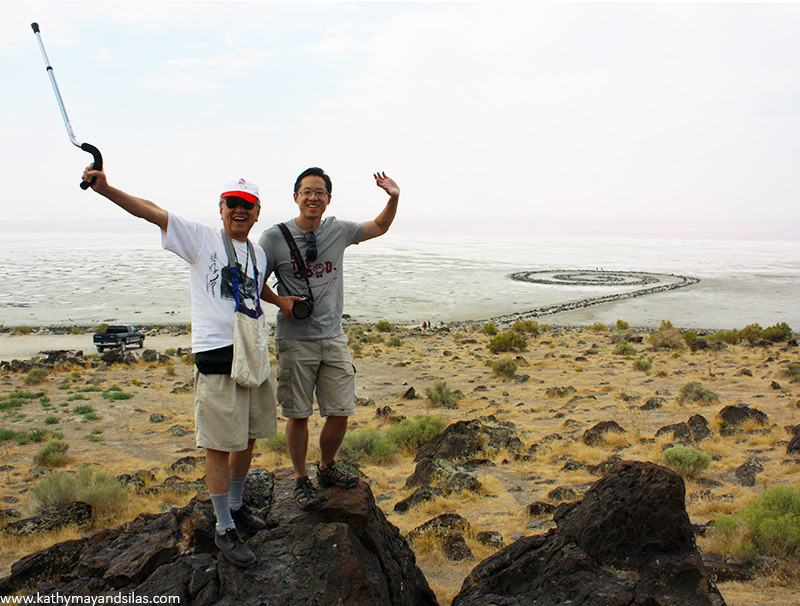 You may or may not be familiar with this iconic earthwork… it is the spectacular Spiral Jetty! After the great American artist Robert Smithson became disenchanted with galleries which he called “mausoleums for art,” he challenged the traditional notions of contemporary art, becoming a pioneer of land art and moving his work to the great outdoors. Spiral Jetty is arguably his most famous site-specific piece. Constructed in 1970, it’s an impressive counterclockwise coil jutting into the water of the Rozel Point Peninsula. 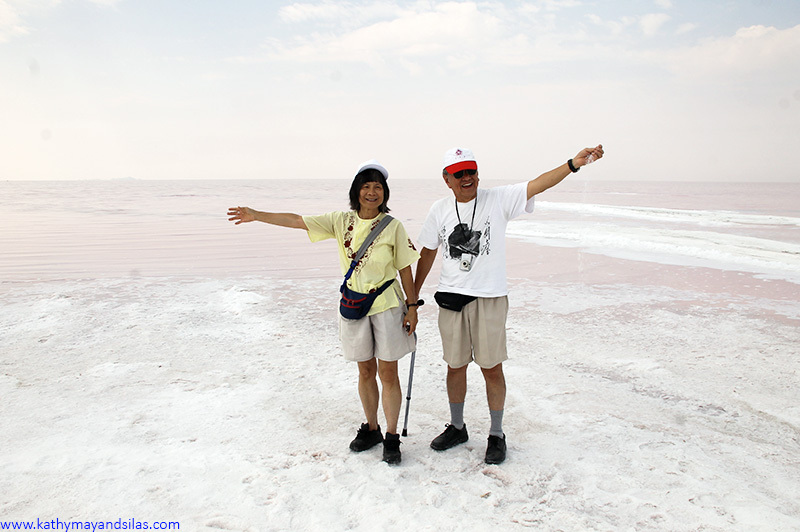 Almost 50 years after it was constructed, we ventured to the northeastern shore of the Great Salt Lake in the state of Utah so that we could experience Spiral Jetty in person! It took a long drive from the main road on an unpaved road to reach it, but the art truly fits the site. Silas’ parents, Willie and Nancy, joined us in this adventure! The backdrop of Spiral Jetty is absolutely alien! Looking towards the land, we saw massive basalt boulders left behind by an extinct volcano lying amongst puffs of yellow-green brush and scrub. Then the shore abruptly transformed into a tundra of salt, with a surface that cracked and fragmented under our feet. Eventually, the ground became lattices of crystalline deposits, with miniature salty pyramids atop. In the distance, the waters of the Great Salt Lake appeared reddish, a hue caused by the abundance of microbes. 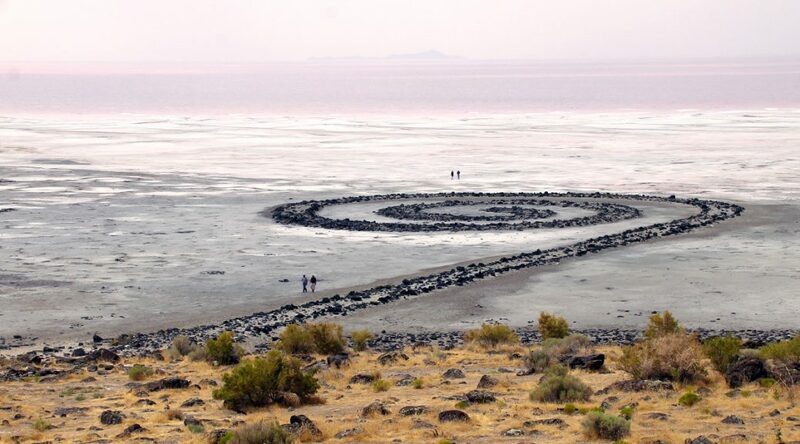 In making Spiral Jetty, Smithson and his crew (two dump trucks, a tractor, and a front loader) displaced 6,650 tons of mud, salt crystals, and basalt rocks from the shore, strategically repositioning the earth and rock into the interactive curvy structure it is today. From a distance, the design is awesome (see it on Google Maps). From our point of view, the scale was impressive. Spiral Jetty is 15ft wide and 1,500ft long, and we were dwarfed in comparison. A core tenet of land art is its susceptibility to the cycles of nature. In 1970 when Spiral Jetty was created, water levels of the Great Salt Lake were particularly low. In 1972, it became submerged and remained that way for 30 years, except for rare and brief appearances. 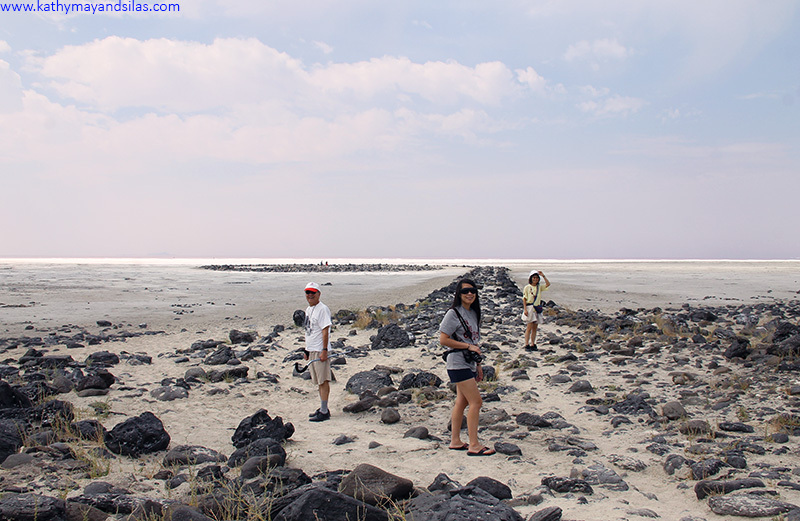 However, in 2002, severe droughts caused the lake to recede and Spiral Jetty has remained visible since. We wonder what Spiral Jetty will look like when you visit. Let us know in the Comments section below! That is truly amazing! We have been to Utah twice, but had not heard of it. We love seeing the unusual and enjoy visiting hidden gems. This may have to go on our bucket list. Your posts are amazing as well with your wonderful flair for writing.